Twelve Moraine Valley students with Act Out Now visited the Greater Chicago Food Depository this Wednesday, March 26 to lend a hand toward ending food insecurity in Cook County. According to a Feeding America study recently released, data shows there are 807,690 food insecure people in Cook County currently. That means one in every six people are chronically hungry and do not know where there next meal will come from. These are startling statistics and the number is on the rise. Well, today, we tried to make a tiny ding in the problem by packing at Chicago’s food bank. Today we packed bulk corn flakes into one-pound bags, boxed them, and prepared them for shipping to some of the 600 agencies the GCFD serves throughout Cook County including local food pantries, soup kitchens, and shelters. 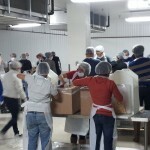 We worked hard as a team, and, when all was said and done, packed 216 cases of corn flakes; that’s 2,116 lbs of corn flakes. Not bad. Thank you to everyone who turned out. Thank you Maya, Emily, and Eugene from the GCFD for hosting us, and thank you MVCC students!